Rep. Mitzi Johnson presents her appropriation plan to committee members Friday afternoon. The chair of the House Appropriations Committee released a long-awaited draft proposal Friday to bridge the state's $113 million budget gap. The plan, authored by Rep. Mitzi Johnson (D-Grand Isle) and distributed to committee members Friday afternoon, is anything but a final product. It will, however, serve as a framework for House appropriators as they complete a budget in the next two weeks. Because Gov. 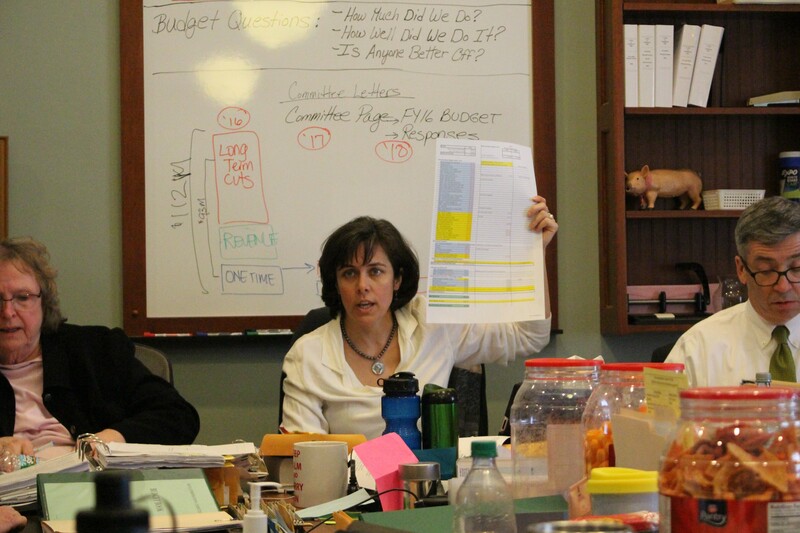 Peter Shumlin presented his January budget proposal shortly before an $18.6 million revenue downgrade, Johnson's committee has been in the unusual position of having to come up with far more money than the administration. She proposes doing so through a mix of cuts and one-time money. Johnson took many of her ideas from what she called "the list of the big uglies" — $28 million worth of cuts suggested by legislators and the administration — which was released two weeks ago. In addition to cuts, Johnson also made use of about $4 million in one-time money in her proposal and temporarily shifted $2 million in Vermont Housing and Conservation Board funding to the state's capital bill. Johnson's proposal addresses only the $18.6 million hole left by January's downgrade. It assumes that the House will approve all of Shumlin's proposed budget cuts and revenue increases, which is anything but certain. If her colleagues decide to restore any of the Shumlin-suggested cuts — the consolidation of public safety answering points, for example, or $10.8 million in unspecified cuts to state worker compensation — they will have to find other cuts or approve additional revenue.